One of the good things about appetizers is that they are easy and quick to prepare; this one is no exception. The combination of the radishes, ginger and scallion is intriguing, in the good sense. Chop the scallion, peel the ginger and grate it, slice the radishes, set aside. In a small bowl mix the cream cheese, about 3/4 of the scallion, olive oil, ginger and salt. 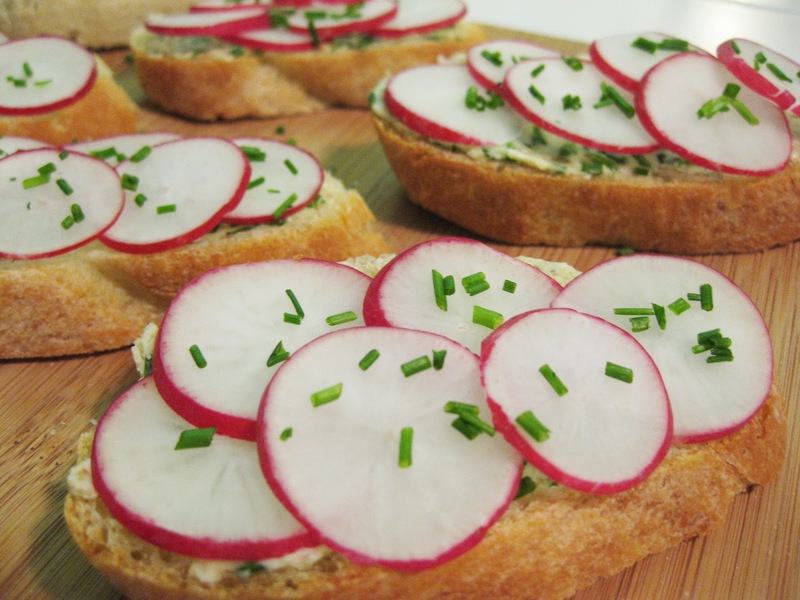 Spread the mixture over the baguette slices, top with slices of radish. Garnish with the remaining scallion. Source: Slightly adapted from Bon Appétit. Categories: Radish, Recipes | Tags: appetizer, sandwich, vegetarian | Permalink.